This entry was posted on Monday, August 9th, 2010 at 10:37 am	and is filed under Uncategorized. You can follow any responses to this entry through the RSS 2.0 feed. You can leave a response, or trackback from your own site. Lovely pictures.. Almost feel the salt air.. Keep us in the loop, we love seeing your adventures. It looks like you are having a lot of fun along with the quilting. Wonderful way to see the sights. Ah, the lovely water. As Maggey said, looking at the shots, I could almost feel it, too. 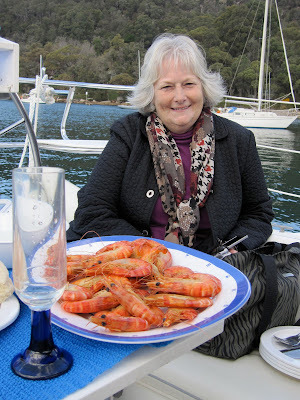 Sue, I don't know if I want those prawns or all those lovely quilts, enjoy your time. so jealous!!! I hope you guys are enjoying your time!!! Love ya!